How many types of dog doodles are there? You'd be amazed at the number! Bark Busters in home dog training has trained virtually every breed combination. Bark Busters Home Dog Training has seen a big rise in training doodle dogs! How many different types of doodles are there? There are literally oodles of doodles. Doodles are a cross between two breeds and are often called “designer dogs”. Many people choose doodles because they are looking for a certain quality within a breed. 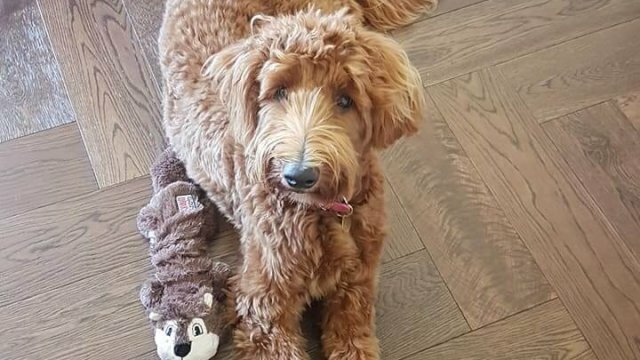 For instance, a Goldendoodle sheds less than a Golden Retriever yet has the fun-loving personality of a Retriever combined with the intelligence of a Poodle. Here are some of the more popular doodles. Generally, you can name a breed and someone has crossed a poodle with it! We’ll add to the list as they arise.